Editor’s note: We sometimes get misty-eyed thinking about past bikes we loved, as well as ones that should remain forgotten. We decided to take you on a trip down memory lane with bike tests that got filed away and forgotten in the MXA archives. We love reminiscing over a piece of moto history. 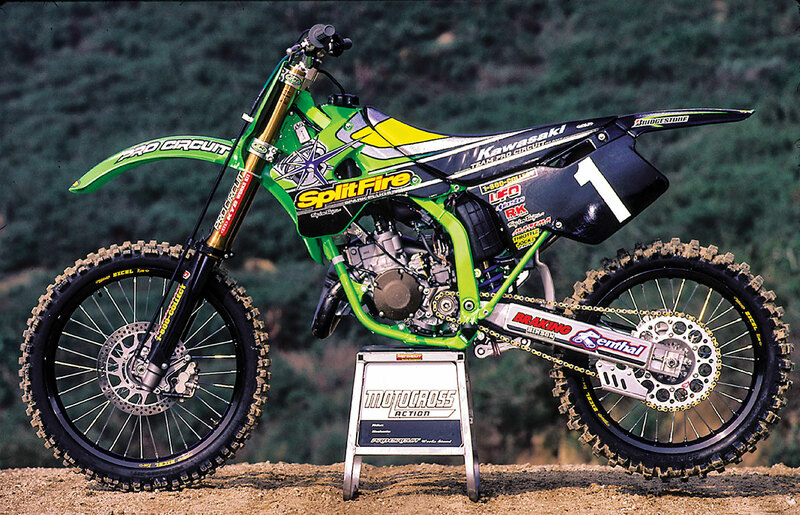 Here is our 1998 test of Ricky Carmichael’s Pro Circuit/SplitFire Kawasaki KX125 two-stroke—straight out of the pages of a 21-year-old magazine. What makes Ricky Carmichael the champion he is? 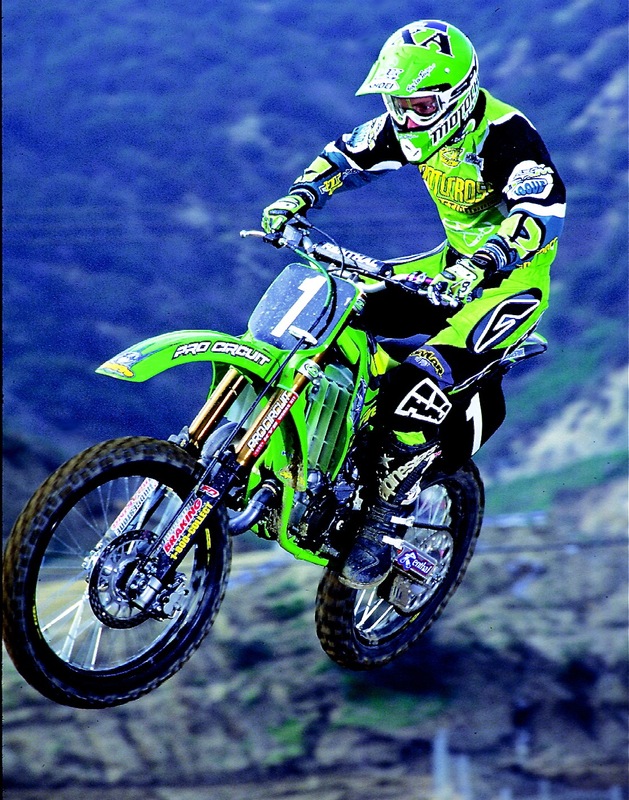 Is it his natural talent, training program, parents, Johnny O’ or his Team SplitFire KX125? 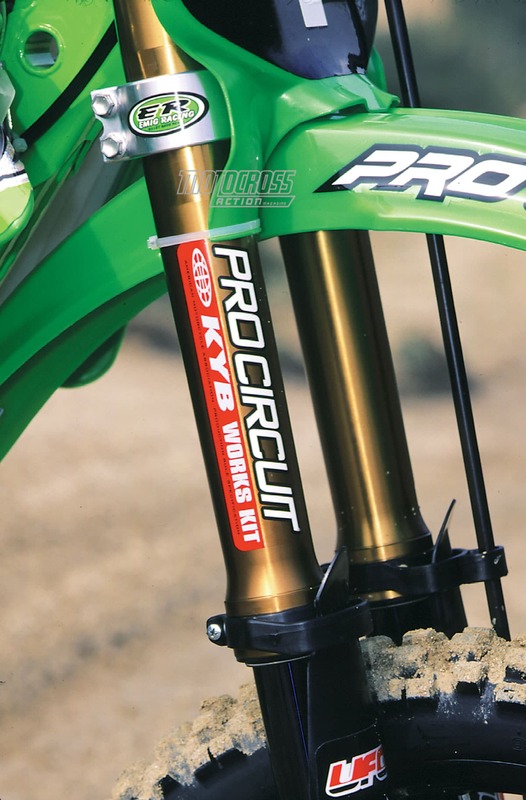 No one knows for sure, but when Pro Circuit’s Mitch Payton offered us the opportunity to spend a day riding Ricky’s full-race 1998 Kawasaki KX125, we were determined to solve one piece of the puzzle. 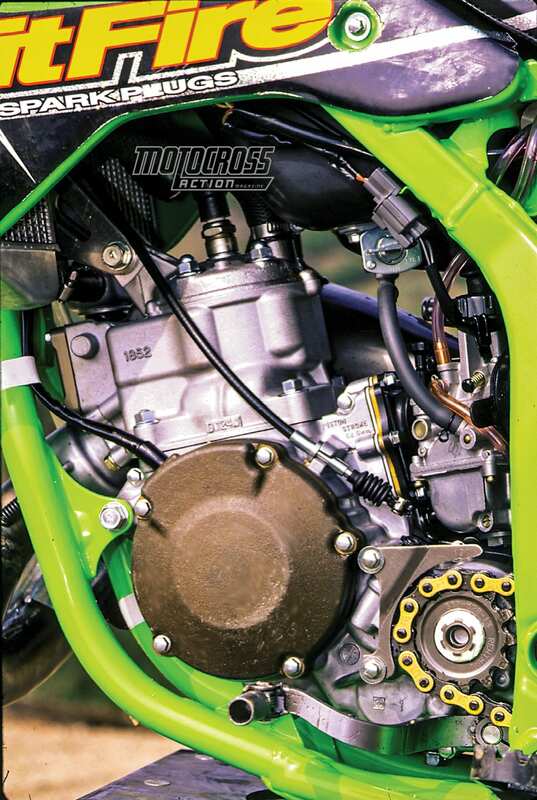 WHEN MITCH PAYTON OFFERED US THE OPPORTUNITY TO RIDE RICKY’S FULL-RACE 1998 KAWASAKI KX125, WE WERE DETERMINED TO SOLVE ONE PIECE OF THE PUZZLE. It’s no secret that Ricky Carmichael has taken the motocross world by storm. 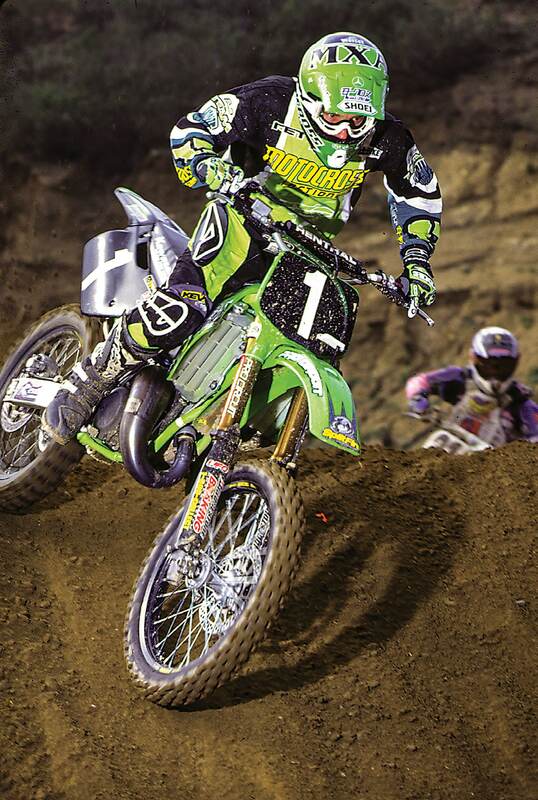 He won the 1997 AMA 125 National Championship straight out of the amateur ranks and is such an odds-on favorite to win the 125 East Supercross crown this season that many riders are ducking him. He has a reputation as the hardest-training, most-determined old-school racer of the last five years. The MXA wrecking crew wanted to know what kind of bike a hammerhead like RC really rides. What better way to find out than by riding it? HOW DOES RICKY SET UP HIS CONTROLS? Being little in size (not in status), Ricky never bought into the high-bar hype. He likes his bars centered over the triple clamps. Why does Ricky choose to be close to normal? Because if he ran his bars as high as Button, Bradshaw, Ferry and the rest of the crew instead of his head being positioned over the triple clamps, half of his body would be dangling out front. CARMICHAEL’S THROTTLE, LIKE ALMOST ALL PROFESSIONALLY PREPARED RACERS’ TWISTERS, IS LIGHT, BUTTERY SMOOTH AND NEARLY ELASTIC. Team SplitFire usually swaps the stock Kawasaki clutch lever (and perch) for a Honda CR unit, but not on Carmichael’s bike. Ricky has ridden Kawasakis his entire life and has adapted to the KX’s dead feel compared to the sudden action of the Honda lever geometry (the other riders on the Pro Circuit team like the CR action better). Carmichael’s throttle, like almost all professionally prepared racers’ twisters, is light, buttery smooth and nearly elastic. It snaps on and off with ease‚ thanks to constant maintenance by his mechanic Chad Watts and a Pro Circuit aluminum throttle barrel. 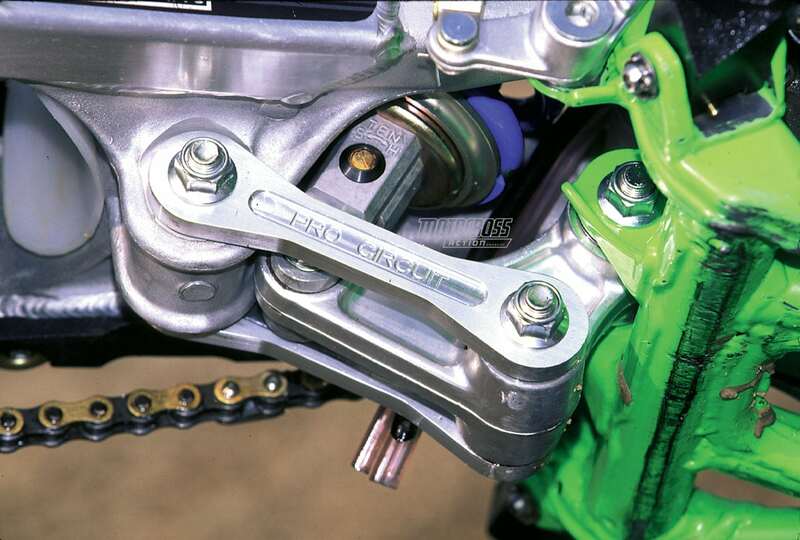 Other notable changes to the controls on Carmichael’s KX125 are Pro Circuit titanium footpegs and a works steel shifter. The footpegs are no larger than the stock Kawasaki’s, so they function more as weight-savers and eye-catchers than anything else. The stock aluminum shifter is changed for a works steel unit simply for strength. 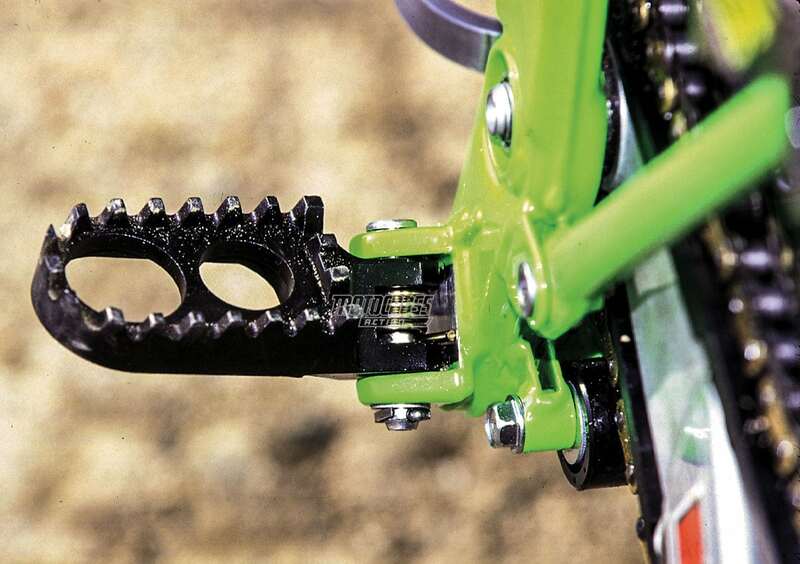 Nobody likes to lose a race because of a bent shifter‚ Carmichael included. WHERE ELSE DOES RICKY DIFFER FROM HIS TEAMMATES? 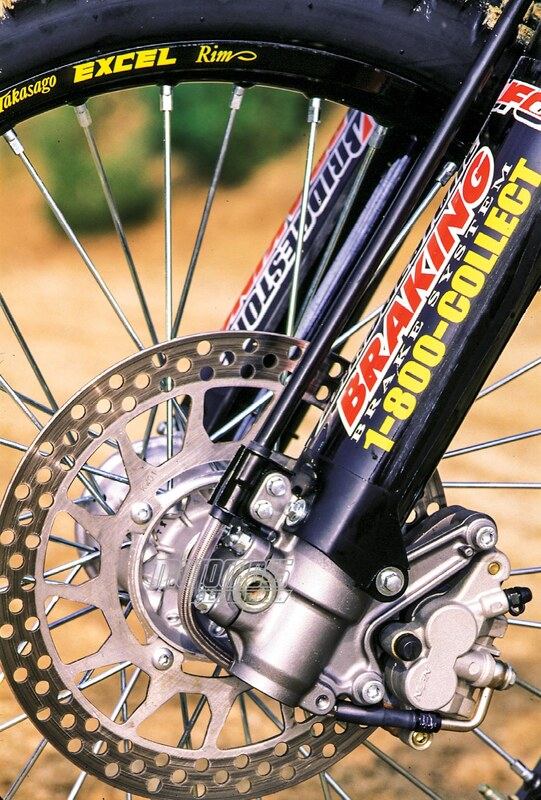 Carmichael, like the rest of his SplitFire teammates, runs Braking’s big rotors on both ends of his bike, but the choice of master cylinder is the subject of some controversy. The rest of the team prefers a Honda master cylinder mated to the Kawasaki caliper. Not Ricky. He believes that the Kawasaki master cylinder puts out enough pounds per square inch of braking pressure to handle his stopping chores. He centers his attention on the brake line. The stock line flexes, which creates a mushy feel. So, Ricky runs a braided, stainless steel line from Fastline. Actually, the MXA test crew thought that Ricky’s brakes were as powerful as the ones his teammates use. WHAT ABOUT RICKY’S WORKS SUSPENSION? If you thought that the AMA had banned works suspension in the 125 class, you are right—and wrong! The factories have discovered a loophole. Ricky Carmichael has works Kayaba forks on his KX125, but to get around the rule, Kayaba claims that they are kit forks that anyone can buy (for more than $3500). We doubt that Kayaba would sell a set to anyone not on a factory team, but go ahead and try. Carmichael and SplitFire aren’t the only teams using “rule-bender” suspension. Team Primal Impulse/Suzuki uses upside-down Showa kit forks. Team FMF/Honda takes the stock Kayaba forks off its CR125s and replaces them with upside-down Showa kit forks (available from Factory Connection). SO HOW DID RICKY’S SUSPENSION FEEL? Very stiff. Starting with Ricky’s standard compression setting of 8 clicks out, we had to turn the clicker all the way out to get the forks to move. We expected Supercross suspension, but what’s funny is that Pro Circuit’s suspension guru, Bones, had just finished telling us earlier in the week about how Carmichael did his fastest lap times at the Kawasaki Supercross track after they had forgotten to stiffen Ricky’s suspension back up (they had softened the suspension for the Perris Winter Supercross). Carmichael’s rear shock is a semi-works part just like the front forks. 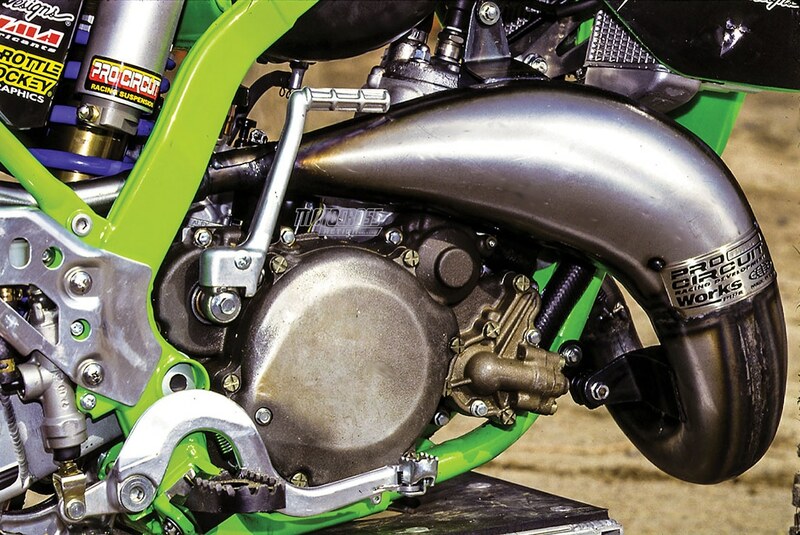 Unlike the stock KX125 shock, Carmichael’s Kayaba features high- and low-speed compression adjustments. Although the shock is stiff, it was actually usable on an outdoor track. HOW DOES RICKY’S ENGINE WORK? Fast. It is fast and hard to ride. Fast and demanding. Fast, but only if you ride it fast—and we mean very fast. 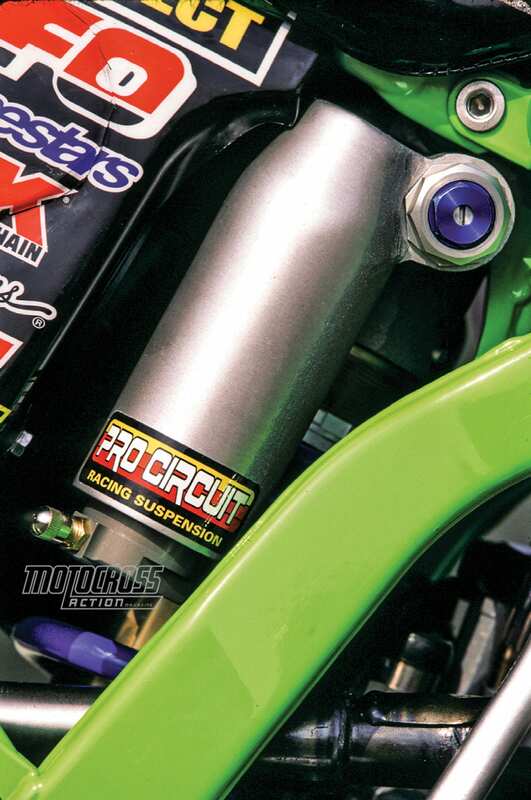 Pro Circuit has built Carmichael the ultimate midrange engine. How fast this midrange engine is can be measured by how hard it pulls on your arms when you climb into the burst exiting corners. Burst doesn’t really do justice to the 250-type hit that Carmichael’s KX125 delivers. Did we like the engine? That depends. At the beginning of a moto, we wouldn’t have wanted any other engine. 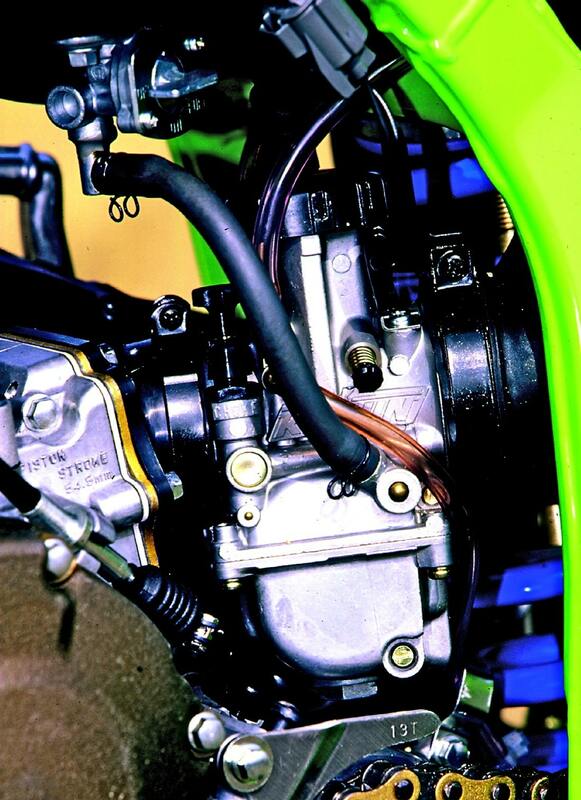 When we were fresh, we could keep the KX125 percolating, grab fresh gears and keep it on the pipe; however, midway through a moto, we weren’t as happy. By that time we had started to get tired and sloppy. This is not the kind of engine that rewards laziness. If we shifted a little too early, it would fall off the pipe. There was no transitional low-end to bring it back up. We had to fan the clutch and get back into the middle. By the last couple of laps of the moto, we were wishing for a broader powerband. Face it, you have to ride as fast as RC to make this engine work, and we don’t; and we’re pretty sure you don’t, either. WHY IS THE ENGINE PERFECT FOR RICKY? Ever wonder why Carmichael always looks like he’s charging and putting forth tons of effort? Because that’s how you have to ride his bike. Carmichael’s engine shines when you ride it exactly like he does. Carry your speed through the turns. Get on the gas early. Lead with your face, and never give an inch. It is a Pro-only engine. Anyone with less than great concentration and excellent physical shape would have problems keeping Ricky’s engine on the pipe. You have to ride Ricky’s engine hard. It demands it. Face it, you can’t take John Force’s Funny Car down to 7-Eleven for a Slurpee and you can’t trail-ride on RC’s Team SplitFire Kawasaki KX125). We rode Ricky’s outdoor bike last year, and while it was pipey, fast and a handful, we don’t remember it having a powerband this focused. Every test rider believed that Ricky’s power and powerband were a testament to how fast he is. Mere mortals cannot ride his bike. WHAT IS IT LIKE TO RIDE CARMICHAEL’S BIKE? IN PAST YEARS, RICKY HAD HIS FORKS SHORTENED, TUBES SLID UP IN THE TRIPLE CLAMPS, SUBFRAME LOWERED AND FOOTPEGS RAISED TO COMPENSATE FOR HIS HEIGHT (OR LACK THEREOF). An experience. From first glance, you know Carmichael’s bike is exceptional. The engine looks more like magnesium than aluminum. The black rims ooze attitude. The silencer’s tone is pure evil. In past years, Ricky had his forks shortened, tubes slid up in the triple clamps, subframe lowered and footpegs raised to compensate for his height (or lack thereof). For 1998, the Pro Circuit SplitFire team isn’t making any stature modifications. Everything is standard height. 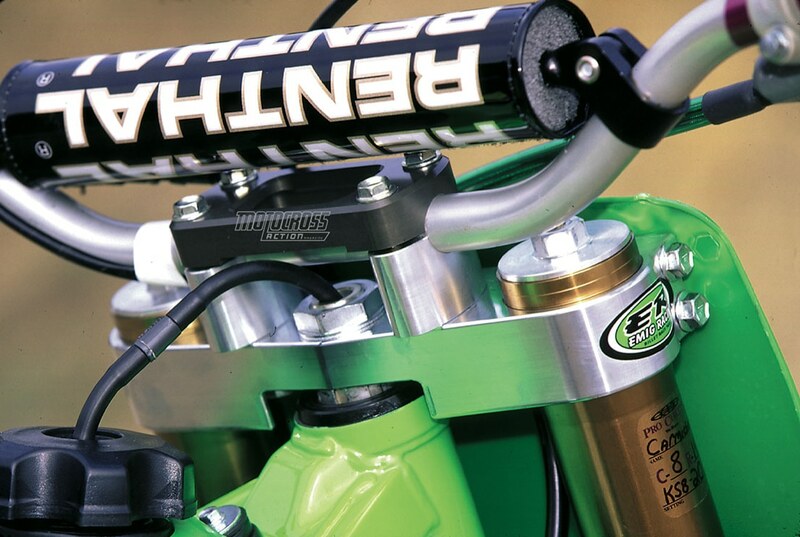 When you ride the AMA 125 National Champion’s bike, you get that same stable, solid feel that all Kawasaki KX125s have, but Carmichael’s bike adds to that equation with sharper turning (thanks to Emig Racing triple clamps and Pro Circuit pull-rods), better shifting (thanks to a taller first gear), stronger brakes (thanks to bigger rotors and stainless steel brake lines) and a ripping engine (thanks to a Pro Circuit pipe, porting, short silencer and lots of Mitch Payton magic inside the engine). WOULD WE WANT TO RACE CARMICHAEL’S KX125? You bet we would! Who wouldn’t? There is one major caveat, though; we’d need a few months to get in the kind of shape that Ricky Carmichael is in to be able to use his powerband to to its fullest potential. Jetting 162 main jet, 42 pilot jet, R1469H-3 needle, #6 power jet and air screw 1-1/2 turns out. Shock spring rate 5.2 kg.